Our Invoice Maker Android mobile app got a new facelift and a bunch of fresh features known from the iOS app. Have a quick overview of all the new stuff added to our Android app in the last 1 year. This feature has been demanded for a long time by many users. Now you know on the first sight whether an invoice has been already emailed to a client by a simple status Sent. Also when the client opens the invoice, the status changes to Viewed and you can be sure your invoice was received and opened. This information was available on the invoice’s timeline on our website before but it is even more comfortable to see it directly in the mobile app. Our website featured a partial payment all time long but with the increase of mobile app usage we had to add this feature to our android app. The good old switcher next to UNPAID is gone and an arrow > has replaced it. 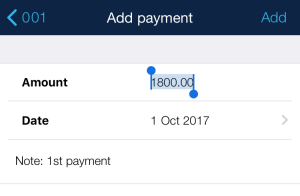 By clicking on it a new window appears where you can edit the final sum, change the date of the payment and include some note to yourself. In case of a partial payment this appears not only on the invoice but as well as in the invoice list – such an invoice has the status PARTIALLY PAID. An old Ferengi proverb says “A contract is a contract is a contract“. For your quotes to become a contract, and also for other documents, we have added a special feature. 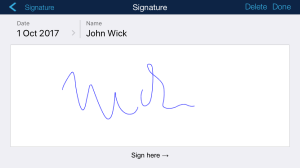 Your clients can now sign a document right in the mobile app. Select a document, click on More and select Sign by client. A new window appears where you can select a date, enter client’s name and let her or him sign it by finger. Our newly designed statistics show a comprehensive overview of your business’ performance. A simple pie chart was replaced by multiple color bars, we’ve added expenses overview as well as an overall balance view. Click on Invoices to see statistics of your Paid, Unpaid and Overdue invoices. Zoom the graph with your fingers to get a closer view and tap on a graph to get more details about the displayed sum. Taxes can be a nightmare for many companies therefore a simple yet exhausting overview is crucial for a business. Now you can set up the beginning of a fiscal year that suits your country- and local laws. The Statistics will match accordingly to that setting and display all your invoices, credit notes, payments and expenses for the selected fiscal year, along with tax calculation. You will find this setting on both mobile app and website under Settings – Document settings. This feature is available also in the iOS app. All your default email texts – whether an invoice text or a reminder – may contain specific tags which turn information from an invoice to real values. Sounds pretty complicated first but it’s a simple and effective feature. E.g. in a default email invoice text „Please find enclosed our invoice No. #NUMBER# for #TOTAL#“ the tags marked with # will change with every invoice and display the real invoice number and total sum. #DOCUMENT_NAME# – document type (invoice, quotation, delivery note, etc.). Simple but helpful – search. You can from now search your invoices and expenses for clients, invoice numbers and amounts. Enter a keyword and Billdu will find the specified expense. Of course you can combine the search with different filtering – e.g. Last years invoices for with amount $100. 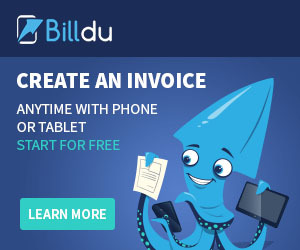 We try hard to make all our apps simple yet powerful with all latest features demanded by Billdu users. Share your ideas with us, your feedback is highly appreciated.